The Orchha Home-stay links responsible tourism with community development. We offer not just board and lodging but an intercultural experience. What better way to discover India than to stay with an Indian family - not a privileged one, but a family of farmers, artisans and labourers who represent the majority of Indians. We want you to experience the hospitality of ordinary Indians who are not professionals of the tourist industry. You will stay in one of the six homes in a simple tiled room that is well adapted to the local climate, clean and comfortable. The rooms are equipped with lights, a fan and mosquito nets and furnished with wooden beds or charpoys, natural cane chairs and a table. Each of these houses has a newly built bathroom and toilet that is shared with the family. 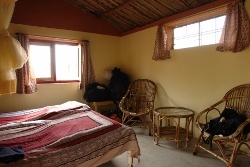 Three houses have Indian-style, composting toilets and three have a Western flush toilet. As water is scarce in the region, we had first chosen to build dry toilets that produce good compost and to filter the waste water so that it can be used for irrigation. More recently, we have opted for flush toilets linked to septic tanks as these are more convenient for some guests. The host families provide tasty, hygienically prepared meals and will dose the amount of spices according to your taste. You should let them know the day before if and when you would like breakfast, lunch or dinner. Sharing a meal with them is often a heart-warming experience. We also arrange on request discussions with the inhabitants of Ganj, cycle tours of the region and visits to surrounding villages, farms, temples, or the Nature Reserve.